ya..I am 12 weeks pregnant with twins baby...Ime & my husband geeting so exited having these.......after 10 weeks I go for my 1st ultrasound..& OMG.......its twins.....I am so happy....please suggest what to do & what not to do in these case. We are having twins too!!! Due in March but will have them in February! I am super excited and scared at the same time! We have 3 girls already, 3,2,and 9 months!!! We did the ring on the string test and it said b/g!!! At my last u/s my Dr. said I have 2 sacs and 1 placenta, but it was to early to tell if the placentas have fused together. I wont have another u/s til 19-20 weeks. I am 12w3d now! Feeling good, hope it continues!!! That is so cute! I am 20 weeks pregnant with twins! We dont know the gender yet because we are finding out next week! Wish me luck! i am having twins tooo. your ulrta sound is very nice. i am preg of 9 weeks and having twins, pls pray for me i wanna boys. 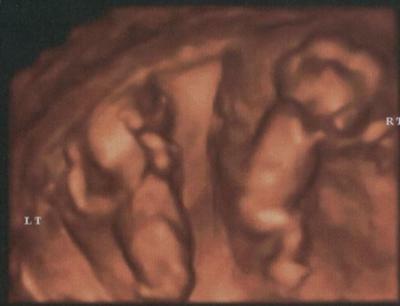 I am a mother of 3 and am now 12 weeks pregnant with twins, it is such a new experience, and was a complete shock! I am excited, but scared of what is to come! What should i be expecting? Congrats...am also pregnant with twins and they are my first babies its really a blessing am so excited and scared last tuesday they were 9w5d and the 2nd one was 8w5d..
That is such an amazing ultrasound! I am 7 weeks pregnant today with Faternal Twins. This ultrasound is great to see! How did you get the OB to do a 4D ultrasound? That is just amazing! I just love it! What an awesome ultrasound.Your babies look so beautiful.It gives me an idea of how much they have developed in 3 months.I am 3 months pregnant with twins as well.I have my ultrasound tomorrow.I can't wait.Good luck with your pregnancy.God bless us all. wow this is your first pregnancy!!!! this is the BIGGGGEST one yet!!! i hope you have lots of fun!!! congrats and good luck to you!!!! !